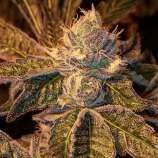 Here you can find a strain description about Floruit and also some user-based reviews and infos directly from the SeedFinder (if available). You can also find the offers and auctions here if Floruit cannabis seeds are on stock at MyCannapot right now. Floruit is Latin for flourish. When we cleanse our internal world and raise our awareness through our meditation, we Floruit. Floruit best describes the life force within these seeds. Both parents originate from the legendary Cherry Pie Kush and OGKB lines, which contain the sour dough and floral kush funk. Dense buds with intense resin formations are to be expected. Expect lots of tight flower formations with purple coloring and a glaze of crystal white frost. Let the flowers reach their full maturity at eight to nine weeks to see the full expression of the Floruit. Most of the weight and flavor is built in the last two weeks of flowering. Buy Floruit now at MyCannapot!